IMPORTANT: As of October 1, 2017 this site is temporarily closed for relocation. Please call 218-749-8161 for updates. 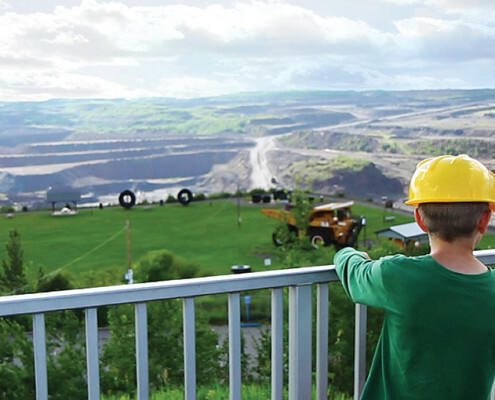 View one of the world’s largest open pit mines from the Hull Rust Mahoning Mine View in Hibbing. Eight-point-one miles long and three miles wide, the mine view is a must-see on the Iron Range. You’ll glimpse two-story haul trucks, super-sized electric shovels and more as they operate in Hibbing Taconite’s mining operations. Kids will enjoy climbing on mining equipment in the park area, as well as shopping in gift store located in the visitors’ center. Friendly volunteers answer questions and point out what’s happening within the mine. Follow Third Avenue in Hibbing past the Greyhound Bus Museum and go right at the Overlook sign. This is the best mine view in the area, with mining activity visible on any given day. Please note, this site is temporarily closed. Please call 218-749-8161, check back often, or visit this site for reopening date. Hull-Rust Mineview is staffed and open daily May 15 through September, 9 a.m. to 5 p.m. Admission is free. Please note, this site is temporarily closed. Call 218-749-8161 for more information. The mine visible from the Hull-Rust visitors center is Hibbing Taconite, operated by Cliffs Natural Resources. It’s one of six working mines in the area and employs about 450. Mining operations take place 24 hours a day, every day of the year. Hibbing Taconite offers bus tours of the mine Thursdays from mid-June to mid-August. Find Taconite Tours on the website for details.